What if you were on the cusp of marrying the guy of your dreams and reaching that career goal you set for yourself, only for all of it to be taken away in one fell swoop? What if this all happened a month before you turned 30? 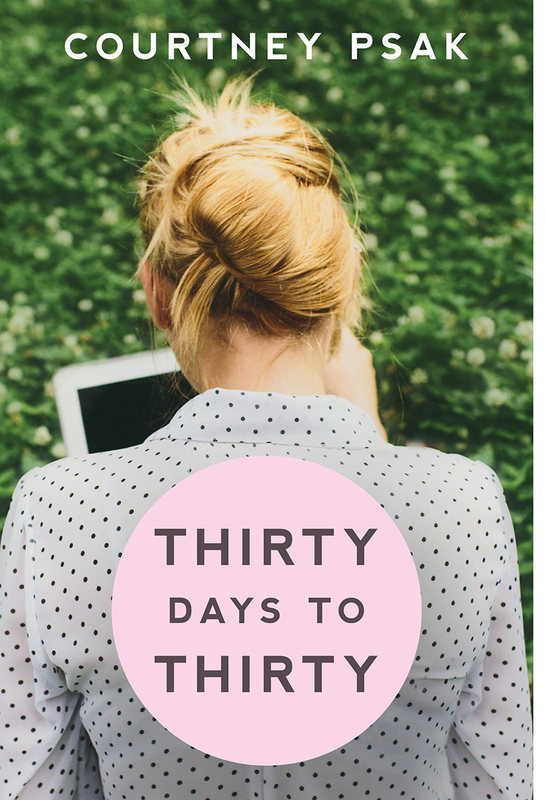 This is the story of Jill Stevens, who after moving back home, finds a list she made in high school of thirty things she wanted to accomplish before her thirtieth birthday. With a month left and hardly anything crossed off her list, she teams up with old friends to accomplish as much as she can before the big 3-0. Along the way, she discovers her true self and realizes it’s not about the material successes in life but the journey. Jill is on the fast track to becoming a partner then, it all goes down hill. She looses her job and her boyfriend, all on the same day. Jill moves back home and reevaluates her life. Here is where it gets interesting and fun! Jill created a list in high school of things she wanted to do before she turned 30. When she realizes that she has done none of these things, she decides to tackle the list head on. Reading about her mishaps and escapades as she attempts every thing on the list, kept me in stitches. The characters worked so well together in this story. I loved Chris. He and Jill are so cute together and Jill’s parents are just plain adorable. This is more than just a chick lit book. The story has many lessons about life, if you pay attention. What a great, cute and quirky read. “So do you want to talk about it?” my mom finally asks me, taking a seat next to me with a cup of tea. My mother basically got the hysterical gist of it when I called her at midnight, crying, and all she could make out was “pig head … boyfriend … cheated on me … fired … homeless.” She sat on the phone with me while I tried to pull myself together, and finally ordered me to pack up and get on the next train home. I look up mid-bite to stare at her. “It’s your thirtieth, it’s a big deal,” she presses. “Fine,” she says getting frustrated. After a few minutes of silence, she leans forward as if to say something and then retreats. “What’s wrong?” I ask her, knowing I won’t be able to avoid hearing what she wants to say. She doesn’t say anything. She simply shrugs and puts the pamphlet back in the drawer. Finally, I give in and proceed to tell her what happened. My father, who’s come in from the garage to get his keys out of the drawer, listens in and eventually joins us at the table. “Tell me about it,” I say, looking down at my milk and swirling the liquid inside the glass. “Can you sue them?” my mom suggests. They’re both silent for a moment and give each other nervous looks. It’s obvious they’re trying to be supportive but they don’t really know what to say. “It’s fine.” I try to convince them and myself. “I’m going to call a headhunter first thing Monday morning and I’m going to bounce back from this in no time. I’ll start looking at apartment listings today. Everything will be fine.” I stand up from my chair. Stay here? I do a double take. I can’t imagine doing that. “Mom, it’s New York. No matter where I get an apartment, as long as it’s in Manhattan, the commute will be doable.” I stand up and dump the remainder of my milk in the sink and load my glass and plate into the dishwasher. “Well, what if you don’t get a job in New York?” she says, turning around in her chair to face me. “Why wouldn’t I get a job in New York?” I ask, confused, as I close the dishwasher and stare out the window. I feel my body turn to ice at the thought. “All we’re saying is maybe you’ve outgrown the city, and maybe now it’s time to settle somewhere closer to home. Maybe you’ll meet someone and settle down,” my mom concludes. “Really?” I say, shaking my head. “You’re really giving me the you-aren’t-getting-any-younger speech when I’m already at the lowest point in my life?” I start to storm towards the hallway. I really don’t need to be hearing this right now. “Sweetie, it’s not that I’m trying to kick you while you’re down, I’m just saying maybe it’s time to start reassessing your life.” My mom stands up to follow me. “Thanks for the talk,” I say, walking past her and back up to my room. I suddenly feel like I’m a teenager again as I slam the door to my room. “Marilynn, she just got home. Go easy on her,” I hear my dad defend me. “Martin, I’m just following the pamphlet,” she insists. Living at home with my parents in my thirties? Maybe I really am a case study. I barely made it out alive the first time, how the hell am I supposed to do it all over again?